Just got it, sounds great to me, am I missing something? I haven't picked up a violin in over a decade, but I've always wanted to go back to it, so I decided to do five minutes of research before heading over to Ebay with a small amount of tax return money and getting this bad boy. 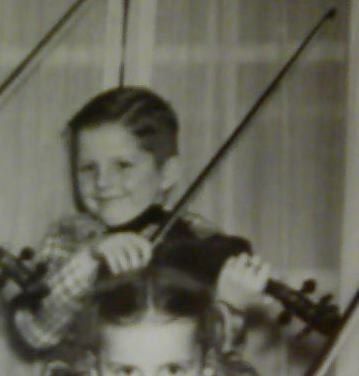 Now the big reason that I dropped the violin in the first place is because my first violin sounded crappy. I thought it was because I was a horrible player and it would never sound better because of my lack of improvement, and my teacher agreed with me. Turns out it was just a crappy violin (I don't know what kind). So I just got this MV300 and it sounds worlds above my first violin, though I have no idea what kind of wood it's made of, or if a professional ear would think it sounds as great as I do. Did I pick the right kind of violin? What the heck is it even made of? Help a lady out, y'all. The internet is giving me the run-around, and this forum seems a lot more friendly and knowledgeable than Amazon. I don't know about the product you are requesting info on. Just wanted to say hello and welcome.. I've owned an MV300. They have a spruce top and maple sides, back, neck and etc. The fingerboards of all the ones I've even heard of are a light coloured wood that is painted. Never could find out what kind of wood the fingerboard is.. BUT.. It is some hardwood that holds up pretty well, and just didn't happen to be *naturally* dark. They have a metal alloy tailpiece. They are a fairly rugged and dependable little violin, and one of the absolute least expensive that is made of real wood and not plywood or particle board. Those are the facts so far as I know them. Now, opinions. I think there are better violins, or at least ones more to my taste, for not a lot more money. If you went even 100$ more, you might find something you like better. Or you might NOT. So much of the sound of violin is the player, rather than just the instrument, and what different people like in the sound varies from person to person.. Check this out.. An experienced player playing an MV300, probably just like yours. Just as it comes out of the box, didn't change strings or get it professionally adjusted by a luthier or something.. Does that sound "good enough" for you? I think it's pretty darn good! Especially for the price. Now, the difference would be that she has years of experience playing violin, and that video was professionally shot, recorded and produced. But if you listen close, you may even be able to recognize that it is a Mendini MV300. They do have a certain sound to them, like any brand. The pro recording and production, it can never make actual crap sound good. What pros can do is present the best sound something can make in the best way. But there does have to be some goodness to it to begin with, for it to end up sounding really good. So that stuff is a factor in that video, but it is not "magic". That Mendini is doing a nice job right there. When I first got mine, I didn't know anything about acoustic violin. I'd been playing electric for a few months. So I thought the sound was crappy. After a few months, I upgraded to a violin I liked the sound of better, and gave the Mendini away to a friend. It was too decent a little instrument to just throw away, and others could get some use out of it even if it wasn't to my own tastes at the time. Now here's another video of a "cousin" of your violin, one of the least expensive Cecilios, and done by our very own Fiddlerman, the owner of this site, and definitely a professional violinist..
You can skip over most of the review and hear him play a bit on it near the end. He definitely is getting some good sounds out of it. It is very listenable, and not horrible or anything. I can tell you that most violin teachers who teach beginners I've seen discussing instruments have really just a couple of concerns. Does it hold tune at least ok? Is it made well enough to not fall to bits in a month or two? And some of them also will mention the action should be low enough to play comfortably, but that isn't as big a concern, since a shop or luthier can trim the bridge to adjust that. I'd say an MV300 is fine on those scores. My old one was used by a kid in their school music program and the teacher not only approved it but actually liked it. So now we come to the most important part. From the your post, it sounds like you like your new violin. That alone is enough to make it rate as "good". And if you like it enough to want to play it a lot and enjoy playing on it, that makes it rate VERY good, at least in my book. Definitely at least good enough to get you started. Violins are a mystery. You got lucky which is a great thing. Glad to have you here and I'm glad that your teacher was wrong. Thanks, Toni! I have a feeling I stumbled upon the exact right violin site and forum. Daniel, thank you so much for answering my questions so fully that I have none left. I'm relieved that my violin is made of real wood and that it sounds as good as I think it does. The videos especially gave me hope. I like that you added that I might or might not prefer a more expensive violin. I'm rather attached to this one, even though it isn't one of the painted ones; I bought a natural wood colored model with the idea to refinish or paint it myself, but when I opened the case and saw my violin for the first time I knew I would be an idiot to do any such thing. Fiddlerman, I'm glad I'm here too. Your videos are helping me a lot, though I'm having to do everything in reverse because I'm left-handed. My teacher refused to teach me that way, so I felt physical discomfort every time I tried to play that crappy little violin. Now that I'm teaching myself and playing the way my body wants me to, I'm so much happier. MV300 is what I bought last fall when I decided I needed to learn violin. I had a bit of trouble with mine right out of the box, but as soon as I put Pirastro Tonica strings on it was a totally different instrument and that's when I fell in love with playing (then came the Fiddlerman carbon fiber bow which was another HUGE improvent). It was a great way to cheaply try a new hobby. I just had no idea I would love it as much as I did so I did end up upgrading after 6 months. The MV300 would have been fine to keep going on but I haven't ever been this excited to play an instrument and really wanted to treat myself to something better. I had played clarinet as a kid and trumpet which I kept up with a few times a year for the past 20 years, but never *loved* it like this. @UG: Don't let a little thing like being left handed, it didn't stop this girl. I am left-handed as well, but play like a right handed person. I tried left handed guitars and flipping over regularly strung guitars back when I first started guitar in my teens, and playing it the way most right-handed people do was what felt the most comfortable/natural to me. I think it was good to try the alternatives, though. For me it just always made sense to use the hand with the best dexterity on the strings and let the right hand cope with the pick. When I eventually learned more complex right-hand things like finger-picking, it took me a bit more time and practice, since my right hand is the clumsier one. So when I got a violin, I didn't try playing it left-handed. But I do have to wonder if a lot of folks might have an easier time with musical instruments if they tried them in all the variations and figured out which felt the most natural before getting down to the business of learning them. Not just left-handed people, but everyone, since I am not so sure as which hand you write with is always a reliable indicator of which way will be easiest to play an instrument. Unfortunately, as I'm sure I don't need to tell you, this is pretty much a "right handers' world", and finding left-handed instruments to even try can be difficult, and they will usually cost more. Stringing the violin differently to try and make a right handed one into a left handed one may not work so well, since there is a long bar inside called the bass bar that runs along the inside under the usual bass string side, and the soundpost is to the treble string side. Also the nut and bridge would need to be re-done so the notches and heights were right for the strings' new order. Maybe with some teachers they just aren't up for the challenge of maybe having to think a little and figure out things like the example Mark_1 pointed out about having to reverse bow direction to get the same exact sound as a right-hander would in some spots when playing chords. One would like to think that someone with the training and experience to be a teacher they would already have some idea on how to cope with a few minor differences for something like left-handed/right-handed playing. Or, as has often been mentioned in these forums, those teachers that won't even try with adult students. I think it's a load of bullcrap. I feel that if a person at any age is motivated and serious enough to be looking for lessons, they should be taken seriously and given the teacher's best effort and all the encouragement that can be realistically offered. However, that is apparently not always the case. I do hope that as the violin continues to increase in popularity as an instrument and to find it's voice in other genres and styles, that a new generation of teachers will emerge that are more adaptable and better suited to equipping their students to really chase some dreams. Hello and Welcome to the Insane World of Strings. I would just like to point out that Cecilio the manufactures of Mendini, makes a true Left Handed Violin. As Do a few other Violin Brands. AS far as teachers go, its hard to find a good one. Happy playing and Remember ENJOY playing. Welcome to the Fiddler Forum Ginger.. I don't know much about these Violins but if your happy with it and you think it plays well and you can advance, I would just play it, enjoy it and get better. Even so, as you advance if you stick with it, you'll know when it's time to upgrade to something a little better and step up. For now, just play and enjoy. Having said that, I started on a very low end Violin that I paid $90 dollars for. I'm not opposed to them and one CAN make them work, but generally they'll need a set-up right out of the box before it's playable. So, if you have some know-how about set up...it's no biggie. If not, it could be frustrating for a beginner that doesn't know, or doesn't like to tinker. SO with mine it had a nut that wasnt even barely cut or filed with a bridge that was terrbily fit and cut. So, I had to learn on the fly abd spent the first 2 weeks just getting it playable. Once I did, I happily played it for about 6 months before I was finally financially able to upgrade to my Gliga which is light years above what I had. I'd say just enjoy it. The beautiful thing is that it's really a "buyers market" right now in the fiddle world. There are GOBS AND GOBS AND GOBS of GOOD Violins out there at absolutely fantastic dirt cheap prices that you can upgrade into when you're ready. Then again, it's up to you...only you will know when and if you need to upgrade. @UnnaturallyGinger How is your playing coming? You know I was gifted a very cheap pink Mendini when I was about three months into playing the violin. I wasn't even thinking about that when you posted originally. I was able to make it work and play with it. I have a you-tube (Its old so my playing was worse)... but it shows that you can make music on a 59 dollar violin. Actually I think this Violin was even better than mine! Sometimes you just have to make due with what you got. At the time I had no cash yet for a better fiddle and being in Argentina little choices. So, I bought a Stradella, cheap Chinese import, for $800 ARG pesos ( $90 bucks ) used. I had to file the nut, file the bridge, re fit the pegs, a bunch of stuff. But I made it work foir 6 months and learned on it....so it's doable. But most beginners I don't think will have the patience for it honestly. I agree Eric. I didn't have the time or knowledge to deal with much. I already had gotten a decent concert violin but my daughter wanted to buy this pink on for me for a surprise. I will say that a new bridge was made for it, and i think I had put a set of second hand strings on it. 2. Because my ear wouldn't have known the difference for a while. Just my opinion but 2 Violins is enough. Once we start aquiring 3 or 4 or more....they just end up being neglected. It's bad enough playing just "one" Violin at a time let alone "2"
I've actually got my beginner Violin up for sale here in Arg...asking $700 ARG pesos for it. It's in good condition and the set up is ok.
Have you done a video on her with that Deadman's tuning? I would love to hear it. I have backed off of the different tunings a bit. I am just too slow at tuning to do it during jam. I want a second fiddle just for that purpose! No not want NEED! Well, if you are gigging or jamming, or paying for recording sessions, then I'd say 2 is more like the minimum. If you break a string or the tuning suddenly goes wonky, you don't want everybody to have to stop while you take care of it. Just switch to your tuned and waiting backup at the first sign of trouble. But beyond that, if you work in alternate tunings regularly, then "extra" instruments definitely do not have to just gather dust. It can be argued that an absolute beginner has enough to worry about at first without dealing with things like alternate tunings, but even fairly early on a song is likely to catch your fancy that just happens to usually be played "funny tuned". I don't think it is that big a jump after a player has made their first few months of progress, and is comfortable with the idea of a special tuning being "normal" for certain songs/sounds. It does mean a bit more practice, since alternate tuning take some practice on their own, but a lot of players are up for that. I don't have that luxury with violin (YET! LOL), but for example I have two 6 string acoustic guitars, and I usually keep one in standard tuning and one in whichever alternate tuning I'm working with this week. I also have two electric bass guitars, and I keep one of them tuned standard and one tuned to what some metal players call "slack B" tuning. That goes way down in pitch; I think the orchestral stringed instrument in that range would be the extended (5 string) contrabass. I don't think there's many orchestral pieces that actually require that range, but it is not unusual in old jazz, rockabilly or metal, and it is just fun to play that far down in the bottom sometimes. It takes heavier gauge strings and a higher action to keep them from buzzing when you tune a bass guitar that low, so it could not be done well by just retuning the regular bass for a song or two. Sometimes instruments also have sentimental value for us, and so we may have more than someone else thinks is "enough". Like with Coolpinkone's "pinky", it was a gift bought for her. So just selling it off for whatever she could get for it might not feel right. On the other hand, I know she has at least thought hard about re-stringing "pinky" to tune down to viola range, so she can give that sound a try. But if one does end up with instruments that are truly "extra" to the point of being redundant and gathering dust, there's always the possibility of gifting them to a friend or family member who want to get started learning. Local schools and college music departments also are usually very happy to get an instrument donated to them. Even ones of very humble price-tag origins, if they are playable or can be made so with some work. I think I will get a bit more going on it. The song is unfamiliar to me...so I have only the sheet as my guide and ... then the sounds of the dual strings. The two days that I played with it... I thought it was KILLLLLER !!! !